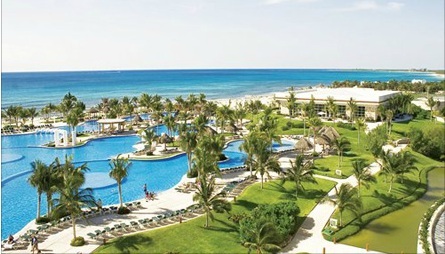 Mayan Palace Riviera Maya near Cancun, Mexico - Bid on a 7 Night Stay in a 1 Bedroom Suite or 2 Bedroom Master Suite! The Mayan Palace Riviera Maya has decorated each spacious room with unmatched style, creating an atmosphere of distinction and quiet. Choose from a 1 bedroom suite, or master suite, all featuring a marble bathroom and many other amenities. OR UPGRADE TO A MASTER SUITE FOR ONLY $100.00 FOR THE ENTIRE WEEK!! This floor plan is essentially the Suite plus. The Master Suite has 2 full bedrooms, 2 full bathrooms, a living area, a kitchen and dining area, and 3 private terraces. The rooms have connecting double doors that can allow as much privacy as you wish. The living area can become the nightly game room, a child’s bedroom on the pull-out couch, or just a place to curl up and watch a movie. The Master Suite is great for large families of 4-8.